I’ve been noticing more and more distracted drivers while I’ve been driving, lately. I stop at a red light and glance over to the car to my left or right and see them texting or talking on their cell phones. As the light turns green they start back driving while they still appear to be distracted by their message and/or conversation. Or maybe it’s a woman with a tube of lipstick in her hand or a parent looking in the backseat at their kids who are fighting. Every time I see a distracted driver, it sends chills up my spine. Because distracted driving can lead to crashes. Distracted driving is NO accident. A distracted driver is making a deliberate choice to text, talk on the phone, apply lipstick, eat that bagel, and a myriad of other things that can take attention away from driving. If you drive distracted you are not only risking your own life, but that of other drivers and passengers. Some years back, my husband and I were driving to a local mall and as we were stopped at a stoplight, we were rear-ended. It really was more of a little bump. The woman was apologetic and there was no damage to our vehicle, so we got back into our cars and proceeded on. At the next stop light she bumped us again. I kid you not. Within 5 minutes she had rear-ended us twice. She was embarrassed and hopefully she learned her lesson and didn’t drive distracted again. That’s my son. When he is in my car he is my precious cargo. 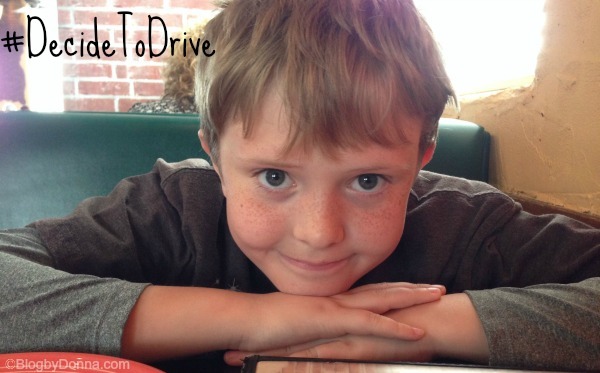 I want to keep him safe, so, my driving, the road, and other drivers get my full attention. I realize that I cannot multi-task while driving. Never. Ever. I keep my hands on the wheel and I pay attention to to the road. I place my purse, with my cell phone in it, in the backseat. There’s no need for me to be distracted by my phone. The American Academy of Orthopaedic Surgeons and the Auto Alliance agree with me and want to increase awareness about the risks of distracted driving. They have started the ‘Decide to Drive‘ campaign which aims to empower drivers and passengers to speak up about distracted driving, continue the conversation at home, at work, and play, with their families, friends, neighbors, and co-workers and reduce distracted behaviors behind the wheel. According to the National Highway Traffic Safety Administration (NHTSA), of the nearly 33,000 roadway fatalities in 2012, there were 3,328 fatalities and approximately 421,000 injuries in distracted driving-related crashes. Orthopaedic surgeons—the specialists who put bones and limbs back together after road crashes and traumas—along with our partners, the automakers, would rather help all drivers “decide to drive” each time they get in the car and to keep bones and limbs intact. Remember, the most advanced safety feature of any vehicle is the driver. The AAOS and the Auto Alliance urges all drivers to keep their most sophisticated safety features engaged at all times: eyes on the road and hands on the wheel. How can you avoid a crash? 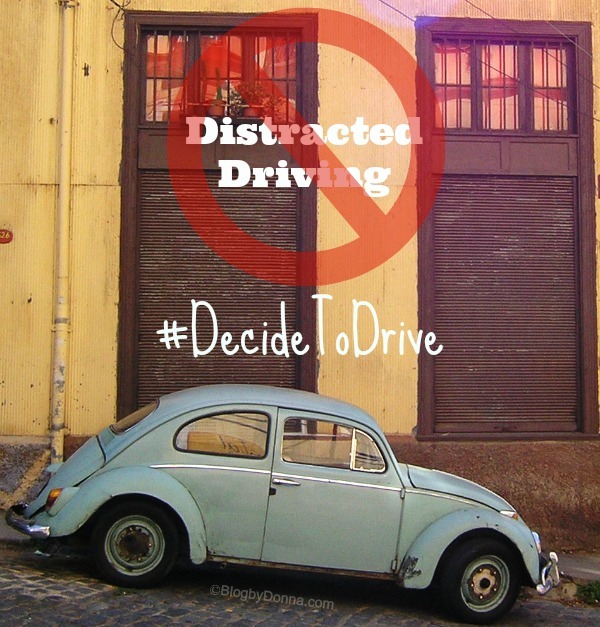 Remove distractions and make the decision to #DecideToDrive. Let’s stop distracted driving. Oh, there will be a Decide to Drive Catchphrase Contest they will run from May 30 – June 13, 2014… I’ll update you with more information about the contest at the end of the month. So stay tuned. It’s so important to not be distracted while driving. What a great campaign. It is rare anymore that I actually find anyone paying attention to the road fully. It is scary and I know a huge reason for it is the use of cellphones. Yes, it is scary out there these days. I “fog out” on occasion, but otherwise pay attention to the road. Very good campaign! I see a lot of distracted drivers too. THANK YOU!!! I cringe at what people are doing while they should be driving!! Such an important reminder, can’t wait for the contest! Distracted driving is an ever increasing issue. I bothers me greatly when I see people texting and driving. That’s how my husband’s car was totaled, a girl was on her phone rear ended him at a stop light with such speed that he hit the car in front of him. Thankfully he wasn’t hurt, but it put us in the position of having to get a new car when our old one was perfectly fine and of course it costs 3x as much to get a new one even with the $$ you get from the old one written off. Great cause, this is so important and awareness is necessary. I hate seeing people with their phones while driving. I wish there was a way to make phones inoperable while a vehicle is turned on. I can not stand seeing people on their phones while driving. Talking or texting is horrible, and it always seems to be the people on their phones who are swerving all over the road!